For many years, AIP Foundation has been lobbying with relevant road safety stakeholders and the government to tackle the use of sub-standard helmets in Vietnam. We are pleased to see that the government has finally developed an action plan for "authorities to crackdown on dangerous 'eggshell' helmets." Read the full news article here. Also this month, the World Health Organization (WHO) released their report "Health for the world's adolescents," revealing that road traffic injuries are the number 1 cause of adolescent deaths globally, and the number 2 cause of illness and disability. Together, we must continue to strengthen our initiatives to address this alarming number. Please read on to see how we are promoting safe roads for our youth. Authorities to crackdown on dangerous 'eggshell' helmets- Motorcyclists may soon be fined if found wearing substandard helmets. In a recommendation by the National Traffic Safety Committee, traffic police would be empowered to seize substandard helmets from motorbike riders. According to the plan, which would come into operation on June 15, traffic police would at first stop riders wearing substandard helmets and warn them. HCM City's Traffic Safety Committee said it planned to begin a month long program to help people understand the difference between safe and unsafe products. Source: The Vietnam News, 19 May 2014. 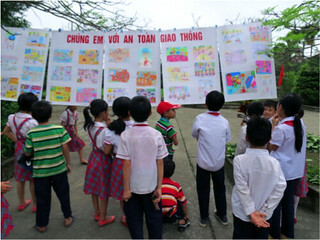 Students of Tai Son Primary School are informed on safe road skills. On April 23 and 25, AIP Foundation, supported by CLEAR, organized road safety extracurricular activities for two primary schools, Ky Son and Tai Son Primary School. The events were attended by 971 students, teachers, parents, and local authorities. Educational and entertaining activities were conducted to help students retain road safety messages, particularly about helmet use. Activities included, traffic sign games, decorating helmets, road safety quizzes, and performances. After each activity day, a group discussion was conducted to evaluate the result of the Helmets for Kids program and activities. At both schools, parents and teachers enjoyed partaking in the games and requested for information sessions to be conducted more often to allow them to better prepare themselves and increase their involvement and participation at future events. Abbott volunteers share road safety messages with students of Tan Quy Tay Primary School. 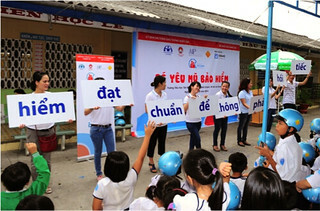 From May 21 to 24, extracurricular activities were held at four Abbott Helmets for Families schools in Binh Chanh District and District 12 of Ho Chi Minh City. At the event, Abbott volunteers played active roles in facilitating and supporting the activities which included, road safety message challenges, picture puzzles, cross word puzzles, and a helmet fashion show at each school. The students were very excited to participate in all activities which aimed to reinforce helmet use and prepare them with road safety skills for their long summer break. VIP guests open the top 100 photo exhibition at Dam Sen Park. AIP Foundation sponsored by FedEx and in collaboration with the National Traffic Safety Committee and the Ministry of Education and Training held an award ceremony for the winners of the 2014 Pedestrian Safety Photography Competition. Over two months, the contest to promote pedestrian safety among secondary school students received a total of 4,175 entries and attracted over 60,000 registrations nationwide. 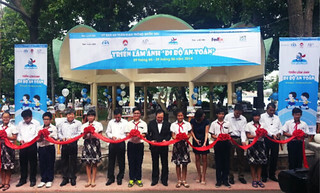 The award ceremony held at Dam Sen Park, District 11, Ho Chi Minh City, recognized the outstanding performance of the winning students and included the opening of the top 100 photo exhibition. Members of the public are invited to visit the exhibition which will be displayed in Dam Sen Park for one month, starting on May 29 to June 29, 2014. New traffic law could save money and lives - Better laws and enforcement that require motorbike riders and children to wear helmets could save more than 500 lives and $100 million over the next six years, a new study says. The study, undertaken by the Asian Injury Prevention Foundation, says a new law now being drafted by the government's National Road Safety Committee, could help drop the death rate and save the government money. Nearly 2,000 people died and more than 6,000 were injured in road accidents in 2013 alone. Source: Voice of America Cambodia, 7 May 2014. 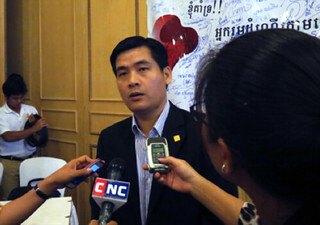 Pagna Kim, Cambodia Country Director of AIP Foundation is interviewed at the Press Conference. On May 7, AIP Foundation released the results of a study on the cost and life-savings of the passage and enforcement of a Cambodian passenger helmet law for adults and children. The announcement is part of a cross-agency effort to persuade the Cambodian government to immediately enact and enforce a draft traffic law mandating passenger helmet use. If the passenger helmet law is passed in 2014 and enforced in the beginning of 2015, helmet use rates among passengers are estimated to increase from seven percent to 55 percent in 2015 and by five percent each following year, reaching 80 percent by 2020. As a result, roughly 561 fatalities will be prevented, 10,572 head injuries avoided, and up to $100 million USD saved from 2015 to 2020. The model used by AIP Foundation to calculate life and cost-savings was adapted from those used in public health by the U.S Centers for Disease Control and Prevention. The study supports road safety stakeholders' efforts to improve passenger, including child, helmet use over the next two years. A student shares road safety messages among his peers. This month, 200 students participated in AIP Foundation's peer-to-peer road safety education program. Funded by Chevron, the sessions updated students on the new traffic law changes and increased road safety awareness school wide. The sessions do not include class teachers which encourages students to engage more comfortably and share real life examples with their peer educators and fellow students. The program aims to maintain sustainability of the Helmets for Youth campaign messages and encourage students to share road safety information with their friends and family, and in parallel allows students to familiarize themselves with important road safety skills and risks. A student receives a helmet campaign t-shirt after participating in a road safety education assembly. AIP Foundation, partnered by Chevron, hosted road safety assemblies at two high schools in Phnom Penh. Reaching a total of 1,000 students, school principals informed their students about the importance of road safety and the schools enforcement of helmet use for youth. Students were quizzed about general road safety issues, particularly around helmet use. By hosting these education sessions during school assemblies, students are reminded about road safety, and teachers and principals are reminded to implement these messages in their day to day classes.